There has been much debate in the music industry recently about whether Spotify is 'good' for music producers. Royalties are notoriously low and listeners to tend to be fickle, listening to a song a handful of times as opposed to an album repeatedly. Either way, Spotify is definitely good for those who listen to music – and the quality of the app reflects this. 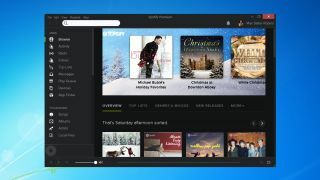 The Spotify app has been reworked in 2014 to include a new, darker design that translates across all devices from tablets to desktops to smartphones. Whereas before there was one design for each, now there is a unified design, and the unification doesn't stop there. Music can be controlled on a laptop from a smartphone, increasingly the usefulness of Spotify at a party or when moving from room to room. The speed and reliability of the desktop programme has also been improved, with far fewer crashes in my experience. Spotify has also opened up the free tier to include streaming on mobile devices (albeit with 'skip' limits), improving the experience for those who use the ad-supported version. Spotify has now cemented its place as the best music streaming service, overtaking Rdio and Pandora and earning a place on over 50 million users' devices.